When Cam Newton takes the field Sunday, most Carolina Panthers fans will be focused on his passing, running, and leadership, not his marital status. But the star quarterback’s personal life has been criticized since his girlfriend, Kia Proctor, gave birth to their son on Christmas Eve. The question is the extent to which marriage and stable committed relationships amount to essentially the same thing. This can become a messy debate, tangling personal morality and social science. It is helpful to get some conceptual clarity. What really matters for kids is family stability and committed parenting. Marriage matters to the extent that it promotes this stability and commitment. At first glance, the evidence seems clear. 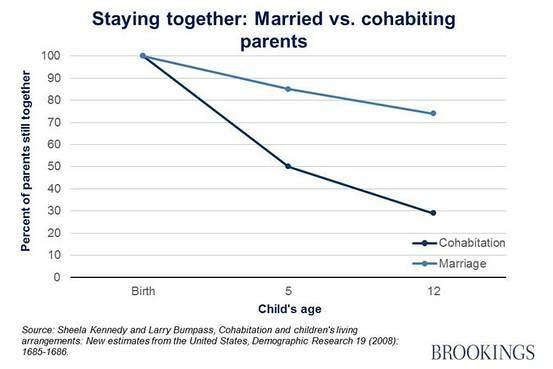 Children born to cohabiting parents do worse on most indicators of health and skills than those born to a married couple, with the negative impacts visible well into adolescence, according to a review from Wendy Manning in the latest volume of “The Future of Children” (a joint Princeton-Brookings publication). But Ms. Manning also shows that among children currently living with both biological parents, there is no difference between those being raised by a married couple compared to a cohabiting couple. To the extent that biological parents stay together and provide a stable environment, it doesn’t much matter if they are married. But those who have chosen marriage before childrearing are those who tend to stay the course. It seems likely that the decision to marry is a signal of this commitment. It is also likely, however, that marriage acts as a “commitment device,” helping couples to sustain their relationship. In terms of policy, the key goal is to help adults avoid unplanned pregnancies, not least through improved access to long-acting forms of contraception, as my Brookings colleague Isabel Sawhill has argued for some time. As we concluded in the Brookings-AEI report: “There is solid evidence that programs that provide counseling, offer a range of birth control measures including long-acting forms, and provide the services free can substantially reduce pregnancy rates among sexually active couples, including teenage and low-income couples, and enable them to avoid or plan childbearing.” This will not only help cohabiting couples plan their families but also would reduce the number of children born to parents who have never lived together and may never do so. Planning, intentionality, stability, and commitment are the cornerstones of responsible parenting. Marriage seems to help achieve these goals, but not for everybody and not all of the time. Cam Newton does not need to be a husband to be a good role model, something Americans seem to expect of athletes. But he does need to be a committed father. And in that goal, he deserves as much public support as possible. Editor’s note: this piece first appeared on The Wall Street Journal’s Think Tank.